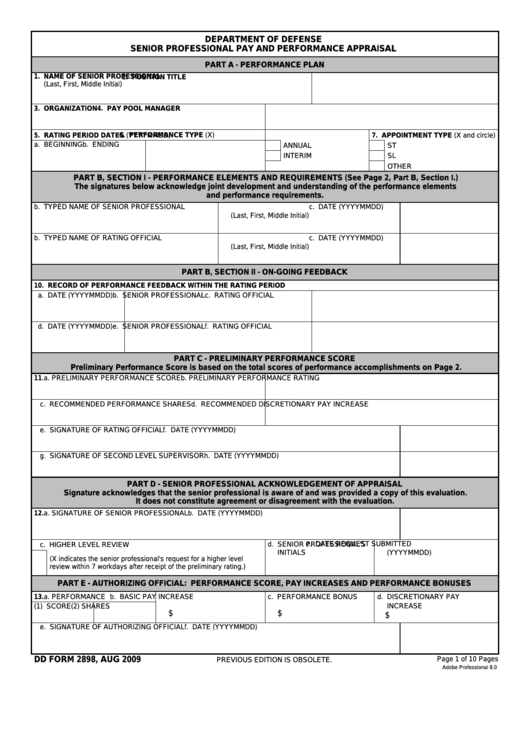 Download a blank fillable Dd Form 2898 - Dod Senior Professional Pay And Performance Appraisal in PDF format just by clicking the "DOWNLOAD PDF" button. Complete Dd Form 2898 - Dod Senior Professional Pay And Performance Appraisal with your personal data - all interactive fields are highlighted in places where you should type, access drop-down lists or select multiple-choice options. Preliminary Performance Score is based on the total scores of performance accomplishments on Page 2. Signature acknowledges that the senior professional is aware of and was provided a copy of this evaluation. It does not constitute agreement or disagreement with the evaluation.